Allow me to describe one of our recent nights. 7:30 PM - Bath water running. We are getting Brody ready to take a bath while watching Brecken sneak into the bathroom. 7:32 PM - Brecken is in the tub, clothes on. 7:35 PM - Two now-naked Littles are now in the tub, scrub-a-dubbing. 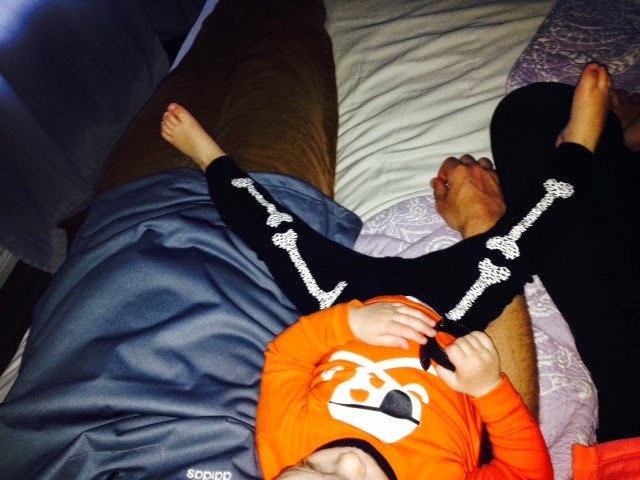 7:45 PM - Brad takes Brecken out to get his "P-jammies" on. I get Brody. 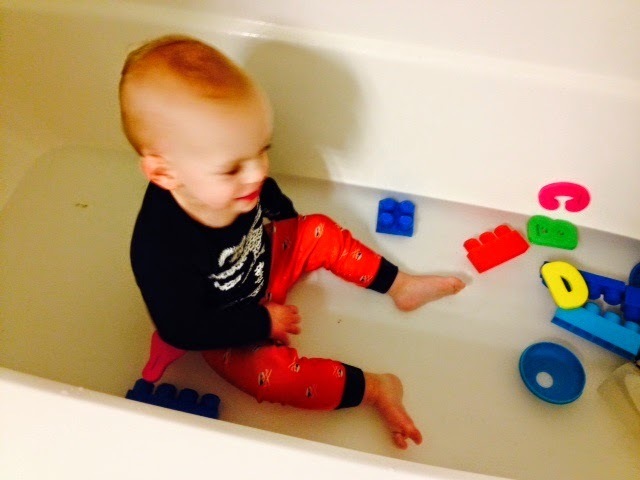 7:49 PM - Brecken has wandered back into the bathtub, fresh P-jammies now soaking wet. 7:55 PM - Brecken now wears fresh-er P-jammies and has made himself comfy in our bed. 8:00-8:25 PM - Enter the 100 steps phase of putting the boys to bed. I think it's actually exponentially more steps if you have multiple toddlers in the house; therefore, we complete the 250 steps to putting two toddlers to bed. 10:00 PM - Brecken is crying. I go in to check on him, only to be met with an absolutely PUTRID smell. People always say you can handle the smell of your own child's bodily fluids and grossness better than you can handle someone else's. This smell, however, is almost unmanageable to even my nostrils, which are pretty tough (if I do say so myself). It's puke. And it's all over everything: Brecken. The crib. The sheets. The pillow. The floor. EVERYTHING. Brecken gets a bath (third of the night, if you're counting) while he screams. I suppose it's quite a rude awakening to be thrown in a tub within 2 minutes of waking up, but what are my other options, people? I hand him off to Brad to be dressed in even more fresh P-jammies. I also begin laundry to get rid of that nasty stank as quickly as possible. 10:10 PM - Brecken has new P-jammies. while Now in bed with us. 12:07 AM - Hear a thump, then a quick pat-pat-pat-pat, door opening, then closing with a thud. Brody has entered our bed. 1:15 AM - Brody is coughing straight into my eardrum, so I take Brecken back to his room (which is also Brody's room.). We lay in Brody's bed for a while until Brecken falls asleep. 2:07 AM - I put Brecken in his bed and return to my own bed, where Brody has sort of stopped coughing. 4:30 AM - Brecken is crying again. I go in to check on him. Poop. No, actually, it's diarrhea. All over his crib. More laundry. More bathing. More sleeping in Brody's bed. 5:15 AM - I'm up and getting ready for school. Brecken is now sleeping well, so I leave him in Brody's bed. As I walk by my own bed I see that Brody is sleeping as well as he has slept all night. Not even one cough throughout the entire time I get ready. Of course. appearance resembling one who has been punched in the eyeballs over and over.